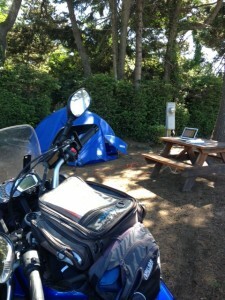 As I write this, I’m sitting outside at a picnic table in my campsite, shaded by tall pines, looking out over a sandy beach on the Pacific Ocean. Life is good. The scenery has been fabulous, the weather almost perfect and the experiences unforgettable. Yet it has not been without its challenges. This IS after all, a working trip and experiment on working from the road, not a vacation. I’ve intentionally thrown myself out of my comfort zone to change how I look at things; to gain a new perspective. And I’ve succeeded. Read: 10 Reasons Why I’m Hitting the Road. Eating a healthy diet. Admittedly, my standards are high – Healthy food that hasn’t been uber processed or injected with goodness knows what; vegetarian, gluten free. When you find it, it’s a treasure. Mostly I try and get groceries for 1 or 2 meals/day; then eat out for the 3rd. Wifi. A must if I’m going to work from the road. Easy enough to find when you’re in urban areas, but my preference is smaller, more intimate places away from the hustle and bustle. It’s been hit and miss. The signal in the State parks I’ve stayed in has been non-existent or too weak to do much with. In private campgrounds, it varies with the locale. In the mountains, it’s often accessed by satellite and if everyone on site is using it, there many not be enough to go around and/or it may not reach my site. Which means trying to work from busy common areas. Skype. Relates to #2 above and wifi strength. I use it to stay in touch with friends and family; also to record podcasts and attend meetings. Again, it would likely be OK if I was in a chain hotel in a popular area, but that wasn’t my intent. Recording podcasts are out of the question and other calls often get dropped. Noise from traffic. Campsites with amenities like showers and wifi are in popular areas. That means traffic and noise. I live out in the country, away from that. Surprisingly I’ve been able to adjust fairly easily, although I try and select sites away from busy roads – and use ear plugs. Right now, I barely notice the traffic with the arm ocean breezes and the view of the Pacific! Noise from other campers. Again, it’s been a distraction but one I’ve learned to tune out. Most campers are very courteous – and hospitable. Nonetheless, it’s been hard to find times of silence and stillness for meditation and reflection. Logistics. This includes deciding which roads to take, how far to travel in a day, finding a suitable campsite with shade, traveling and being in the right place at the right time for the best light for photos, carving out time and place for bike maintenance – like oil changes and new tires – and blocking off time to write, plan programs, etc. Trying to fit too much into one day. With so much to see and do, so many wonderful roads, beautiful places, I need to realize I can’t do it all in one trip. This is a pattern I have, whether it’s over-committing with work or travel. People have generously shared best roads with me; plus I’ve got my own places to visit AND I’m trying to work. Much as I want to, I can’t do it all. This is where I need to call on courage to surrender to the day and stop trying to control the outcome so much. I don’t need to do it all. I remind myself of the purpose and re-focus on my priorities, and what I’m here to do. Meeting fantastic people. Unquestionably this is the best part of the trip. Being able to visit good friends I seldom see in person and meeting new ones has been a highlight. Everyone has a story, everyone is so generous and kind – it’s wonderful. It’s one of the reasons I’m camping. You just don’t have the same experiences when you’re holed up in a hotel room. “Solo travel” is misleading; I’m rarely alone. Missing the routine. Travel can be fatiguing physically, mentally and emotionally. I wouldn’t for a second cut back, but have learned to accept this as part of the adventure. I have renewed respect for those who travel for long periods of time. Illness. Although it has not been major, there have been health issues to deal with. Being away from home, familiarity and country can make this bigger than it seems. Fortunately, all is well.And don’t tell my mom! I’m very blessed to be able to have this trip as part of my journey. I live in a quiet rural setting and control my own schedule and work environment. I travel a fair amount, yet with this trip, have intentionally thrown myself out of my comfort zone. Bot with the riding or technical aspects — they’re second nature. Rather it’s the soft stuff – dealing with change, being away from routine and having to be resourceful. This trip is no different a part of my journey than any other day. These are the lessons of life – and all part of life’s adventure. Sure there are challenges, but they are almost non-existent relative to the benefits. Integrating back into a routine once I’m home and staying indoors, rather than working from the road and being outdoors almost constantly, is going to be the another challenge. But there are a few thousand miles of adventure between now and then!! stay safe and blessed! i wish i was there! Thanks Ronnie. It’s very beautiful! We often hear, “You can do and/or be whatever you choose”. And dismiss or ignore the provision, “as long as you are willing to pay the price”. For many, the reality is that their careers are inextricably bound to a particular place or circumstance. If one can have a motorcycle as their “writing chair” and the open road as their “office” ……then as you state, they are truly blessed indeed. Thanks Kevin. We can make our own reality – but it requires action, not just dreaming. Remind me next we meet up to help you gain some more silence by making you a pair of custom fitted earplugs! I’ll do them for you and it will change a lot of you noise concerns! Thanks Lisa. Will do. I wear ear plugs all the time when I’m riding but hadn’t considered wearing them for sleeping until a week ago. Made a big difference!